In this article I will show how the Windows 10 virtual desktops help keep my brain organized for Office 365 development. It allows me to keep my Chrome Primary work profile for email etc completely separate from my developer tenat Chrome profile. It helps keep me more organized when working on multiple projects as well. Anyone who has more than one development and primary Office 365 account has come across the age old problem of which environment am I currently working in. Using Chrome profiles as a number of people have blogged about has been a huge help in this. Having a Chrome profile for dev tenant and profile for primary account (work email etc) is a huge help. But the downside is many instances of chrome floating around and when you click on a link in Outlook it opens in the last Chrome window you were working on – which is frustrating at the best of times when your dev tenant says you dont have access to your primary email (duh) and then you have to hunt down the primary profile window and go back to outlook and start again. This is where the virtual desktop has really become my best friend for Office365 development. In the latest version of Windows 10 you can easily make a virtual desktop by adding the “Show Task View button” from the context menu when right clicking on the windows task bar. Clicking on the Task icon brings up the option to create a new virtual desktop and also a view of some of things you have worked on recently. Opening a new virtual desktop everything is blank and you can open Chrome and go to your dev chrome profile happily. If I am working in desktop 2 (O365Dev) and I go back to Desktop 1(primary O365), clicking a link in the primary O365 Outlook opens the link in the primary desktop chrome profile. Always. Mentally this also helps me keep my Director day job (primary O365) and dev environment (xomino365) separate and makes life easier. I discovered by accident (as you do) that you can create a new Virtual desktop using the CTRL key and a three-finger down swipe on the laptop. As of MS Build 2018 custom functions in Excel are available for all developers to use and implement. This is actually a huge deal because one of the limitations of the Add-In model in the past is this ability to create a custom function without having to add it to the tool bar as an icon which has to be clicked. With this release it means that develoipers can create their own functions in excel in an analogous manner to VBA. The simple example below adds the two numbers and for no good reason adds 42 as well. But you get the idea. In previous articles I have written about how to interact with a Word document to search and replace and even save the word document to Salesforce. Going back to a more basic level we are going to look at how to build tables in word. We will be using the new Script Lab which is a new Playground Add-In which can be used for development and general tinkering with Add-Ins. This and other articles on the topic are for demonstration purposes and are not hardened for production use. At the most basic level a table is created by instantiating the table object and adding values to it. Using the Script Lab we have seen how we can easily insert a table into a Word document using the Office Add-In API. In future articles we will look at looking for the table we want to modify and then manipulating tables. I wanted to show some love for the new website and book by Michael Zlatkovsky. Michael is a Software Developer and Program Manager in the Microsoft Office Extensibility team. I met Michael at the MS MVP Summit back in October and we had a great conversation or two about Office Addins and their future development. 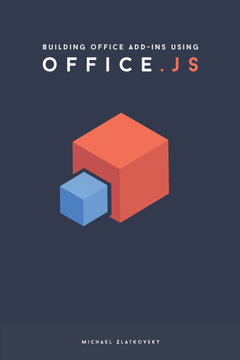 So Michael’s new leanpub book is called Building Office Add-Ins using Office.js and can be purchased through leanpub. The new supporting website http://buildingofficeaddins.com/ provides some of the key information from the book and gives a nice overview thereof while introducing the reader to the more technical aspects of using Office.js. Michael’s a great guy and this is a very valuable resource for Office Add-In developers. I heartily recommend it. Last week at Ignite it was announced that finally Microsoft was bringing O365 SharePoint access to the Microsoft graph as an API. This is a huge deal for those of us who want to use O365 as a platform and develop engaging applications for customers. In my case for Office Add-ins this is great because it reduced the number of OAuth hoops I have to jump through and manage to get the data I want. Here is a link to the documentation: Working with SharePoint sites in Microsoft Graph and a quick example. NOTE: this is beta and will change – this is purely a demonstration of what is possible today (Oct 2016) and not to be used as future reference. How cool is that !!!!! In this article I will demonstrate and discuss how to programmatically save a Word document directly into Salesforce. This article in the Office dev center details how to Get the whole document from an add-in for PowerPoint or Word. We will use the bulk of that article up to the point where we send the slice. We are going to look at a modified sendSlice() function. The dev.office.com article details how you can access the binary contents of the word document, but falls short when it comes to getting the base64 encoded version of the file to be submitted to an external site. This is the complicated part ! Using the code posted on this stackoverflow post we are able to turn a binary string into the necessary format to send the file to salesforce. The final sendSlice() function is shown below. The significant thing to note is that the initial file must be sent to the ContentVersion sobject. Because this is a new document a parentId is not necessary and a ContentDocumentId is created. In a future article we will look at how to then associate this new file attachment is an existing object. // If the slice contains data, create an HTTP request. // Encode the slice data, a byte array, as a Base64 string. // The atob function will decode a base64-encoded string into a new string with a character for each byte of the binary data. // Each character's code point (charCode) will be the value of the byte. // We can create an array of byte values by applying .charCodeAt for each character in the string. In this article we have seen an example of how we can extend the functionality of an Office Add-In to access the binary data of a word document and then save it to a cloud provider (in this case Salesforce).